Ribbon is one of those notions that I have a hard time storing. They come all nice and fancy and organized- but soon after using them a few times, they become a jumbled mess! 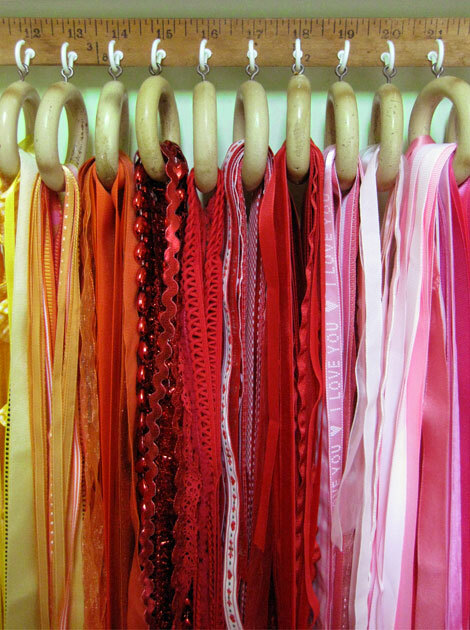 For most of my ribbon, I store them in a drawer. It’s not the best option, but after trying a few different things and putting together a new sewing room – there are better options to try! What I have used in the past is clear ziploc baggies. While that’s ok for short term storage, you’ll find that you’ll get knots (similar to thread) and be super frustrated when trying to pick out what you need. In addition to that you can’t really tell how much is actually left of that type. 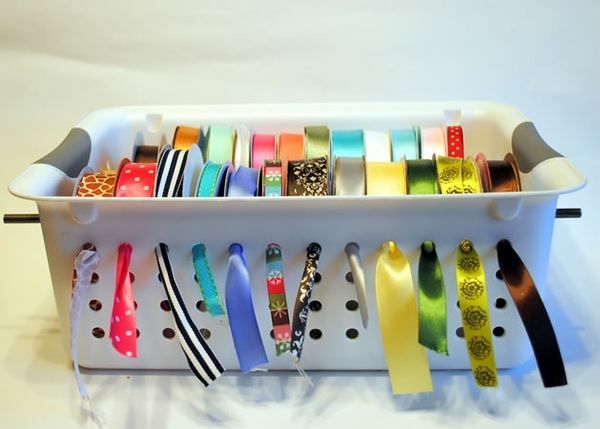 Many times I have found the perfect ribbon and when it was pulled out it was 2″ long! Argh! Ribbon usually comes on a spool. The center hole is typically the same size so that does help when you are choosing a dowel to hang them on. After a time though you will have little ribbon scraps all over because there isn’t enough to stay on the spool. There are a few ideas for those as well– it happens to everyone! 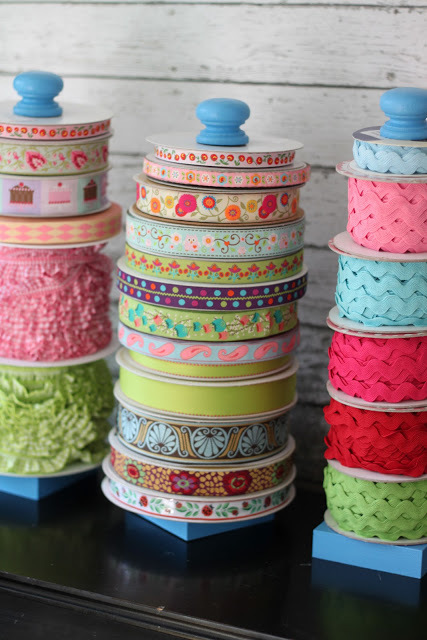 Besides ribbon, ric rac, lace and ruffles are rolled onto a spool. So these ideas are great for any kind of those notions. 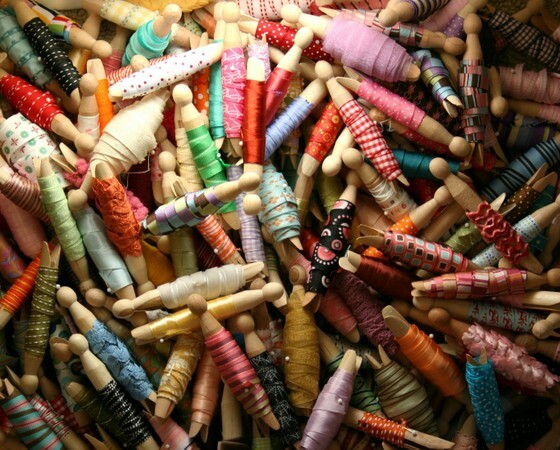 I have two spindles that I use for some ribbon. I need quite a few more- but they are fun to use with the cuter ribbon that can be seen all the time. Tension rods- they can be moved anywhere! Stuff them in a jar! 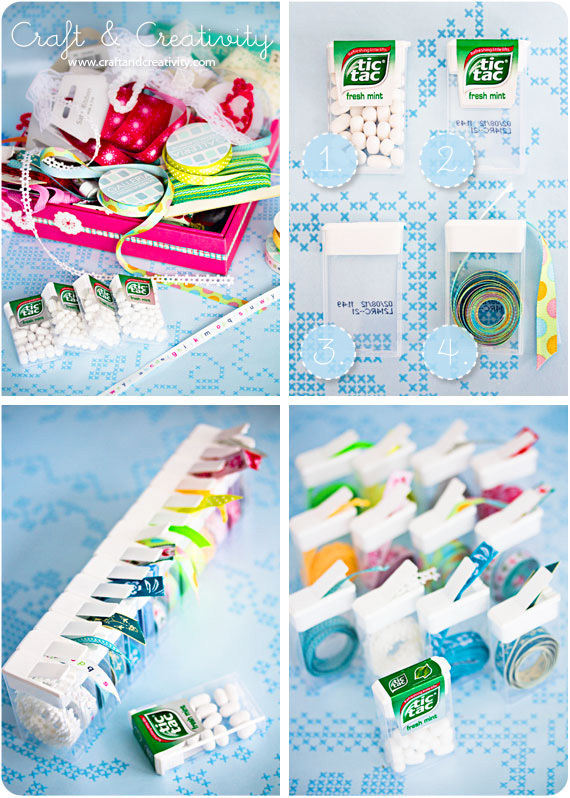 Roll the ribbon scraps into tic tac containers! How fun is that?! 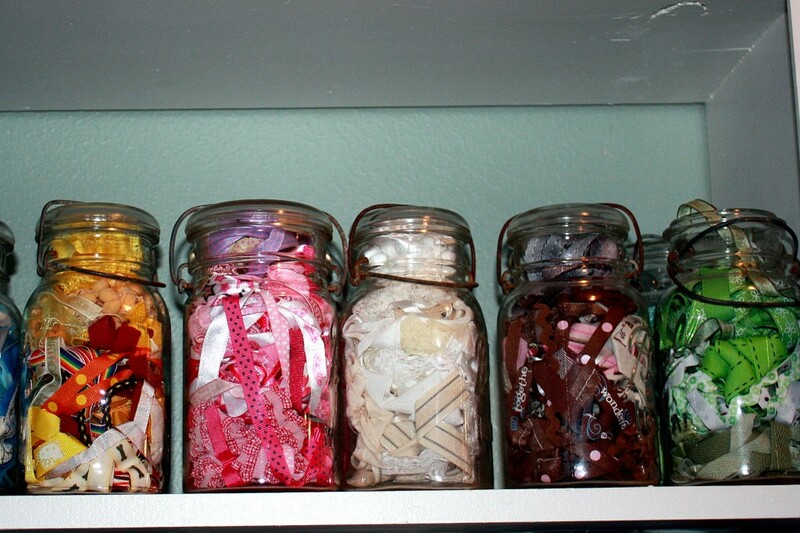 Have a suggestion for storing your ribbon spools and ribbon scraps? Share it! I bought a ton of ribbon when it was on its final blowout sale at the craft store. It was everywhere in my studio. So I bought 36 inch long dowels, small wooden beads that I could screw into the end of the dowel to hold it from sliding off and small wall hooks for curtains. It solved my problem, and since the spools are cardboard, when it’s empty you just rip it off. 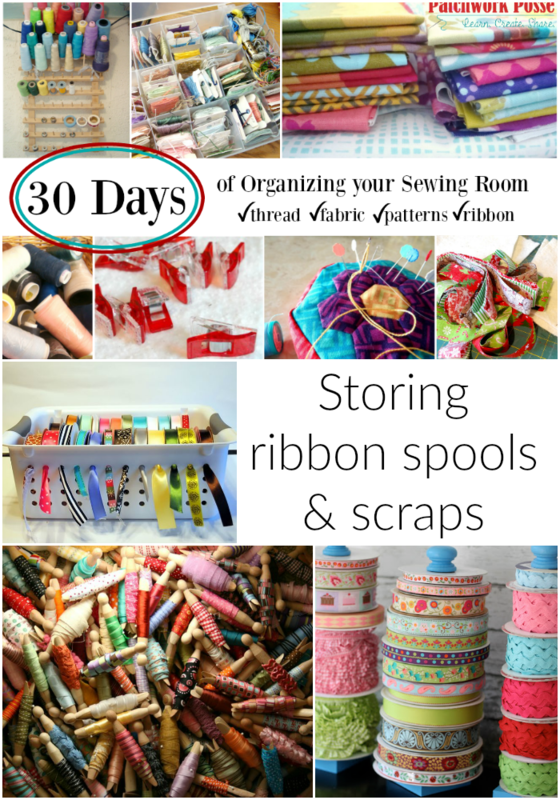 I like some of these ideas — especially the ones where dowels are used to hold the spools of ribbon. I have a lot of ribbon that didn’t come on spools. That is the ribbon I am having trouble getting organized. Some of it I will .likely use in a relatively short time — within 6 months — so I can use part of a paper towel roll and use that on a dowel, but if I was to store it longer then that I would be concerned about it being discoloured or otherwise affected by the chlorine and other chemicals that are in the paper roll. 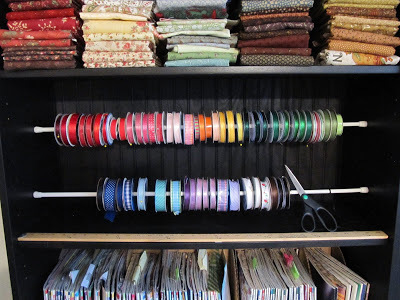 What suggestions do you have for “spooling” ribbon so that it can be put on a dowel system?